Peterson is Familiar with the Amerks Standings; Mittlestadt is Not AHL Eligible · Let's Go Amerks! 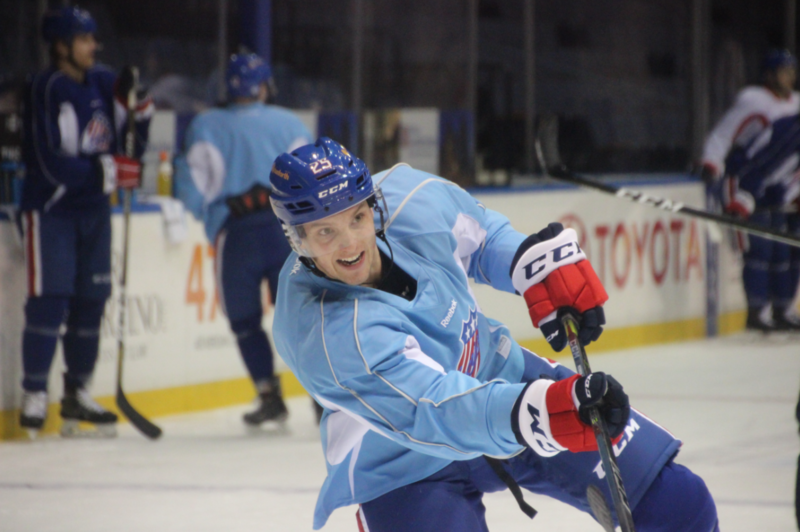 The Rochester Americans returned to work this morning with a practice session that included Judd Peterson, one of two new players that’s joining the team to finish out the season. Will Borgen is the other player that’ll be joining the team and he’ll be at practice on Tuesday, was traveling on Monday. He got the call on the bus ride home on Saturday to join Rochester and would be on a flight Sunday morning to practice today. A quick turn around without time to process the season that just ended for him. He’s disappointed in the way that the season ended for St. Cloud State but said it was a no-brainer come to Rochester to keep playing hockey and see where it goes. He’s also kept an eye on how the Amerks have done throughout the season and noticed on Saturday night when they clinched a playoff spot. At first glance in his first practice he has some wheels and as soon as the team started penalty kill work he was attacking the puck without any hesitation. I didn’t catch who said it but heard one player on the ice mention they didn’t have time to even think before he was on them. Peterson was drafted 204th overall in the 7th round of the 2012 NHL draft. It’s not easy picking up your life and moving within 48 hours but he’s excited to be roommates and teammates with Will Borgen for the rest of the season in helping the transition. Casey Mittlestadt signed with the Buffalo Sabres on Monday morning but will not be eligible to join the Amerks for their playoff run this season. Players on NHL contracts had to be assigned to AHL teams on NHL trade deadline day to be eligible. The only way he could have joined would have been if he signed an ATO (amateur tryout) and then started his entry level contract at the start of the 2018/2019 season. That’s the path Will Borgen is on. Per Bob McKenzie of TSN here’s more details on Mittlestadt’s contract: Because Mittelstadt is a late birthdate (Nov/98), he burns the first-year of his entry-level contract as soon as he signs it, but he does not get to count this season as a pro year, which means he won’t need to be protected for expansion draft (assuming it’s in 2020). When his entry-level contract expires in 2020, he won’t be a full RFA. That is, like Johnny Gaudreau and Jaden Schwartz, amongst others, who graduated entry-level with limited experience, he won’t be able to receive an offer sheet and has no salary arb rights etc. CJ Smith and Justin Danforth are the two injuries impacting the Amerks right now and both are hopeful to be ready for the playoffs. CJ Smith would jump right back into the lineup. This time of year there’s always questions about lingering or nagging injuries that guys are playing through and whether or not anyone needs some rest. Tough decisions ahead on who gets to play and who doesn’t. Taylor has said the toughest part of his job is sitting someone out.